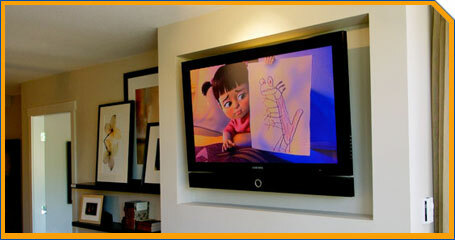 Crystal Audio Video Design has completed thousands of installs on walls, off ceilings and even above fireplaces. Let our experienced installers help you. 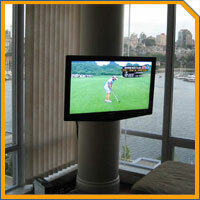 Bill and Joy Benson had been looking at upgrading the television in their bedroom to an LCD flat screen as digital cable had recently become available to them in their Yaletown condo. 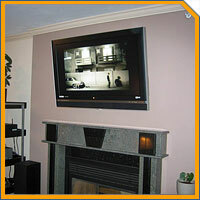 After purchasing a Sony Bravia 40" LCD HDTV they needed just the right solution for mounting the new television on their wall, which like most new downtown condos, featured metal studs behind the drywall. Crystal Audio Video Design provided the couple with a custom-made bracket for mounting the screen and concealed the wiring from the TV to the new digital cable box and DVD player within the wall before attaching and testing the bracket and TV. The company also hooked up and tested all the couple's equipment for free as they opted for a full install (concealed wiring). Jim and Anita Crowe recently purchased a 50" Plasma HDTV for their living room to go above their fireplace and needed advice and the services of an installation company. They wanted to have the TV hooked up to their existing entertainment center and a cable box, but wanted all the wiring hidden, and the new TV mounted as close to the wall as possible within the exisiting enclave above the fireplace mantle. 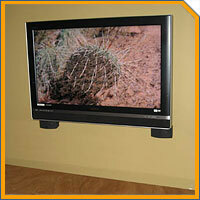 Crystal Audio Video Design provided the couple with a custom-made bracket for mounting the screen close to the wall. Wiring was concealed from behind the TV to a location to the left of the fireplace, where the entertainment center was set up. The company also hooked up and tested all the couple's equipment for free as they opted for a full install (concealed wiring). Please use either our handy calculator or the table below to get a more general services estimate. For definitions of the individual service elements please see below. (Note: on the calculator when the "concealed wiring" and "fireplace concealed wiring" options are selected the resulting cost includes the base cost of "basic wall mounting". For a detailed estimate on services offered through Crystal Audio Video Design, please use our handy request a quote form or contact us via phone at 604.772.7308. We will deliver your new plasma / lcd from major stores free of charge (within a reasonable distance), with purchase of our services. 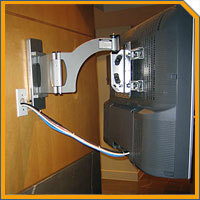 Non Destructive bracket and TV mounting on your wall with exposed wiring. Running wires inside walls (vertically) between the TV and baseboard. Component stand required, or available upon request. 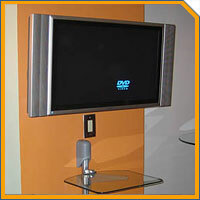 Crystal Audio Video designed a bracket featuring smallest space between TV and wall on the market. We will customize it on the spot for you. Connecting your components and optimizing them with your TV, price varies between $75 and $125. Free with purchase of full installation (one of the two concealed wiring options must be chosen). Crystal Audio Video can provide you on the spot with high end, mid end and standard component cables, HDMI and others for your system. Prices vary based on quality and cable length required. All prices in Canadian Dollars. Prices are subject to PST, prices are subject to change. Prices include all labor and minor materials (face plate, extension power cords, screws, bolts, tool fees, etc…). All work performed is previously tested, insured and left in working condition by Crystal Audio Video Design. 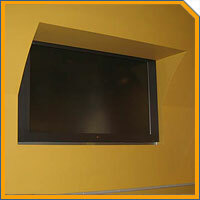 For complete home theatre integration, please see our Complete Solution section. 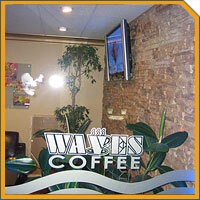 For speakers hookup and installation, please see our Speakers Installation section.